SUN Yuanyuan, LIU Jia, FU Weineng. Construction and Identification of the MYCT1-GST Prokaryotic Expression Vector[J]. Journal of China Medical University, 2018, 47(6): 499-502. Abstract: Objective To construct MYCT1-GST prokaryotic expression vector and purify MYCT1-GST recombinant protein. Methods Using cDNA synthesized from peripheral blood RNA as the template, the open reading frame of MYCT1 was PCR amplified and ligated into the pET28a(+) vector. The recombinant DNA was sequenced to verify successful vector construction. BL21(DE3) cells were transformed with the MYCT1-GST construct, and the expression of MYCT1-GST was induced by IPTG. 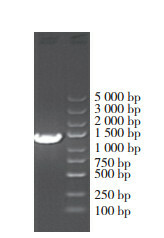 Western blotting was performed to determine whether the recombinant protein was purified successfully. Results Sequencing and PCR results confirmed that the open reading frame of MYCT1 was cloned into pET28a(+) and its expression was induced by IPTG. Thus, we could successfully purify the MYCT1-GST recombinant protein. Conclusion We successfully designed the MYCT1-GST expression construct, which may aid further studies on proteins interacting with MYCT1. 邱广斌, 邱广蓉, 徐振明, 等. 6q25区域内一个新基因MTLC的克隆及特性分析[J]. 中华医学遗传学杂志, 2003, 20(2): 94-97.